Scientists at NASA and the European Space Agency believe volcanic activity on Io is located 30 to 60 degrees East from where they expected it to be based on data that supports the prevailing view that most of the heat is generated in the asthenosphere. 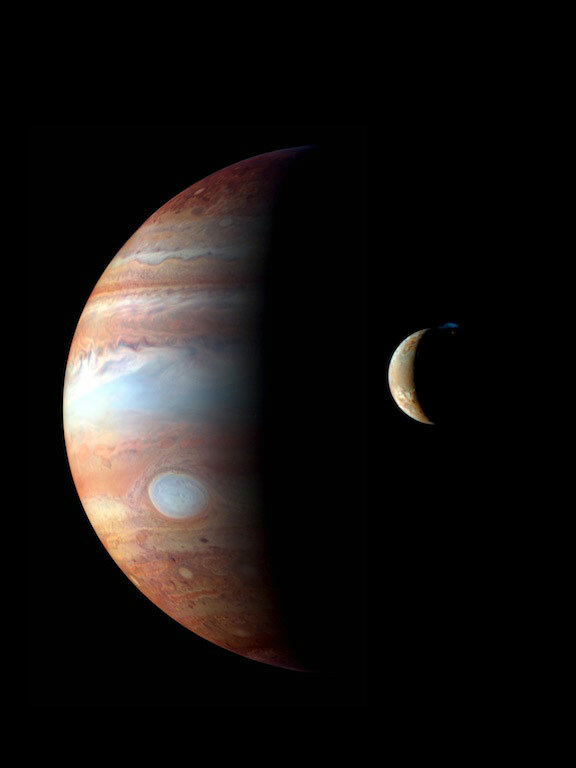 Io is caught in a tug-of-war between Jupiter’s massive gravity and the smaller but precisely timed pulls from two neighboring moons that orbit further from Jupiter – Europa and Ganymede. Io orbits faster than these other moons, completing two orbits every time Europa finishes one, and four orbits for each one Ganymede makes. 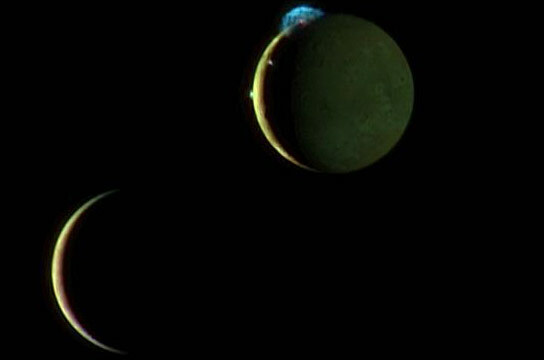 This regular timing means that Io feels the strongest gravitational pull from its neighboring moons in the same orbital location, which distorts Io’s orbit into an oval shape. This in turn causes Io to flex as it moves around Jupiter. 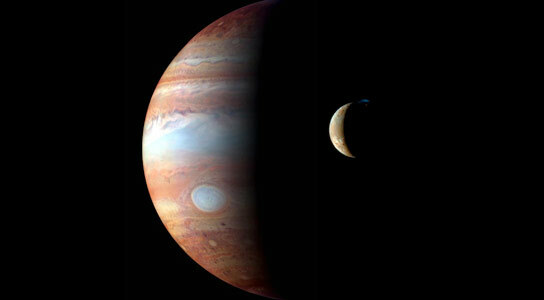 For example, as Io gets closer to Jupiter, the giant planet’s powerful gravity deforms the moon toward it and then, as Io moves farther away, the gravitational pull decreases and the moon relaxes. The flexing from gravity causes tidal heating — in the same way that you can heat up a spot on a wire coat hanger by repeatedly bending it, the flexing creates friction in Io’s interior, which generates the tremendous heat that powers the moon’s extreme volcanism. The question remains regarding exactly how this tidal heating affects the moon’s interior. Some propose it heats up the deep interior, but the prevailing view is that most of the heating occurs within a relatively shallow layer under the crust, called the asthenosphere. The asthenosphere is where rock behaves like putty, slowly deforming under heat and pressure. “Our analysis supports the prevailing view that most of the heat is generated in the asthenosphere, but we found that volcanic activity is located 30 to 60 degrees East from where we expect it to be,” said Christopher Hamilton of the University of Maryland, College Park. Hamilton, who is stationed at NASA’s Goddard Space Flight Center in Greenbelt, Maryland, is lead author of a paper about this research published in Earth and Planetary Science Letters. Hamilton and his team performed the spatial analysis using the a new, global geologic map of Io, produced by David Williams of Arizona State University, Tempe, Ariz., and his colleagues using data from NASA spacecraft. The map provides the most comprehensive inventory of Io’s volcanoes to date, thereby enabling patterns of volcanism to be explored in unprecedented detail. Assuming that the volcanoes are located above where the most internal heating occurs, the team tested a range of interior models by comparing observed locations of volcanic activity to predicted tidal heating patterns. 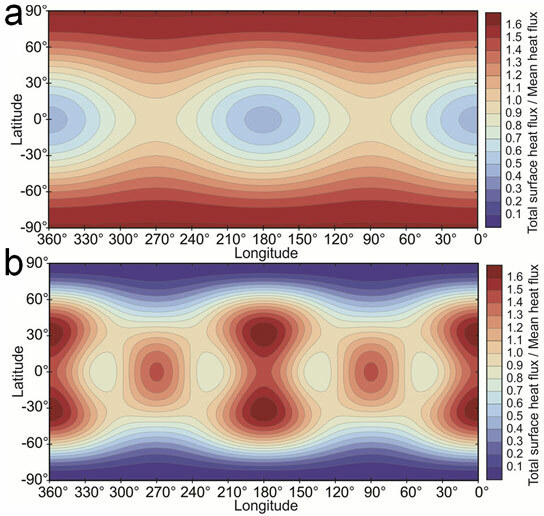 Possibilities to explain the offset include a faster than expected rotation for Io, an interior structure that permits magma to travel significant distances from where the most heating occurs to the points where it is able erupt on the surface, or a missing component in existing tidal heating models, like fluid tides from an underground magma ocean, according to the team. The magnetometer instrument on NASA’s Galileo mission detected a magnetic field around Io, suggesting the presence of a global subsurface magma ocean. As Io orbits Jupiter, it moves inside the planet’s vast magnetic field. Researchers think this could induce a magnetic field in Io if it had a global ocean of electrically conducting magma. Tidal heating is also thought to be responsible for oceans of liquid water likely to exist beneath the icy crusts of Europa and Saturn’s moon Enceladus. Since liquid water is a necessary ingredient for life, some researchers propose that life might exist in these subsurface seas if a useable energy source and a supply of raw materials are present as well. These worlds are far too cold to support liquid water on their surfaces, so a better understanding of how tidal heating works may reveal how it could sustain life in otherwise inhospitable places throughout the Universe. Io’s volcanism is so extensive that it gets completely resurfaced about once every million years or so, actually quite fast compared to the 4.5-billion-year age of the solar system. So in order to know more about Io’s past, we have to understand its interior structure better, because its surface is too young to record its full history, according to Hamilton. The research was funded by NASA, the NASA Postdoctoral Program, administered by Oak Ridge Associated Universities, and the European Space Agency. Be the first to comment on "Io’s Volcanoes Are Not Located Where Scientists Expected"